What can having your MAST permit do for you? Anyone who serves alcohol needs a MAST permit; it does stand for Mandatory Alcohol Server Training after all. But did you know that even ID checkers have MAST permits? And also, that you need a MAST permit if you're helping out by serving the wine at someone's banquet event, or wedding dinner? There are two kinds of MAST permit; the Class 12 Mixologist permit and the Class 13 Servers permit. A Class 13 Servers permit will allow you to take and serve alcohol orders, and pour it into a customer's glass at the table, but not to draw wine or beer from a tap, or mix drinks. If you're between 18 and 21, this is the permit to apply for. A Class 12 Mixologist permit allows you to do everything someone with a Class 13 permit can do, but also draw beer and wine from a tap, mix drinks and manage an establishment. You can upgrade your permit when you turn 21 by taking the appropriate course. At Americas Alcohol Certified Education Association, we offer upgrades and renewals - so whether you need to upgrade to a Class-12 permit, or simply need to get your yearly renewal, we can help! MAST permits are good for 5 years, which means that you'll suddenly be popular at all of your friends' weddings and events as someone they can call on to help out serving the celebratory champagne! Of course, it also means you'll be an easy hire for any bars looking for staff; they don't have to wait for you to get your permit and you've already shown that you're dedicated to the world of bartending. Get your Washington alcohol permit with AACEA.com and start practicing your champagne towers for all those summer weddings! At America's Alcohol Certified Education Association, we provide alcohol server classes for servers and bartenders to get their Class 12 permit in Washington. We are also committed to providing as much knowledge as possible to our bartenders-to-be. There's a lot more to becoming a bartender than just pouring drinks for paying customers. For anybody who's considering becoming a bartender there are a couple bartending basics that prepare any good bartender for the coming day: You must have the right tools and the right workspace. Any bartender will tell you, organization is key. You don't want to be behind an unorganized bar, with a line of customers out the door who are waiting for drinks. This is frustrating for you as a bartender, and frustrating for your customers who won't understand why it takes so long to get a drink. You need to make sure you have access to everything you need for your shift - everything needs to be readily available or easy to grab without having to leave the bar. Keep your bar tools close, and make sure your most popular liquors are within arms' reach. It also helps to check the menu at your establishment and make sure that you have the ingredients available for any drink specials you might be offering. It also helps to have popular garnishes ready to go - especially citrus. Cut these up before hand and have them ready to go so you're not cutting fruit when your bar is the busiest. You won't get very far as a certified bartender if you don't have the right tools. These tools include strainers, shakers, bottle or can openers (a "churchkey" works well for both), a corkscrew for wine, and a few rags to mop up should anything spill. Safety is key, so it's handy to have a mat behind the bar along with a mop and broom for any mishaps. It's also important for certified alcohol servers to know a few different types of glasses for the drinks they'll be serving: Highball glasses are often taller than old fashioned glasses (or "rocks" glasses). Tumblers aren't the same size or shape as pint glasses. White and red wines have different size and shape openings. For more information on bartending school in Washington or to get your Mandatory Alcohol Server Training certification from home, visit www.aacea.com! ...Local bars will be using QR codes to advertise taxi companies to help get [clients] home safely. Young adults will simply use their smart phone to scan the codes on table tents, posters and business cards to easily view a list of taxi companies. This initiative, adopted by establishments with alcohol service, provides a way for drinkers to get home safely, and still enjoy a drink or two. In a similar measure, Seattle continues to improve it's Seattle Nightlife program aimed at curbing drunk driving by providing safe transportation alternatives. Info on overnight parking is posted on parking meters city wide - offering Pre-Paid parking for the next day, should drivers choose to leave their car parked instead of driving drunk. The program also focuses on making Taxi zones more visible and dependable in parts of the city with concentrated nightlife destinations, and strives to make bus service more dependable and accessible for drinkers after a night out on the town. The Seattle Nightlife initiative is aimed at maintaining public safety, while providing businesses with greater flexibility to adapt to the market demands of residents and visitors. What can you do as an alcohol server? Keep an eye on your patrons and know when enough is enough. Part of responsible alcohol sales & service is being able to read your customers. Not only that, but it's helpful to keep a list of numbers for local taxi services on hand. Most reasonable patrons will thank you for keeping their best interests in mind. Part of becoming a certified bartender is providing responsible alcohol service aimed at reducing drunk driving. America's Alcohol Certification Education Association is committed to teaching future bartenders the basic tenets of responsible alcohol service and sales. For a list of our online alcohol certification classes, please visit www.aacea.com. We've lost so many lives recently to addictions - especially alcohol addictions. With headlines decrying car crashes and binge drinking, and newspapers talking about the dangers of mixing drinks with medication, some may start to ask how to prevent these type of events. And accusations start flying at the bartenders that continue to serve and over-serve these clientele, who quickly become a danger to themselves and others. At AACEA we educate alcohol servers on how to serve alcohol responsibly and how to become a better bartender. We feel it's important to look at these cases of driving under the influence, and assess where we can do better. Our students at AACEA are the first line of defense against drunk driving. In the case of more experienced drinkers however, it isn’t that easy. 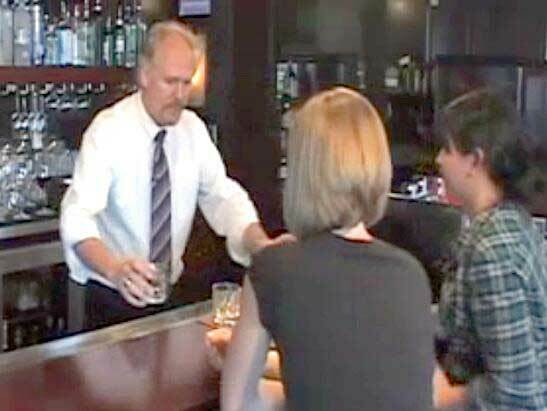 “The bartender and wait staff have the obligation not to serve someone who is visibly intoxicated,” Bush said. “What they have to realize is that someone can be drinking and not appear to be intoxicated because the last drinks haven’t hit his system. It all depends on the person; someone who is a regular drinker will be able to drink more.” To make things more difficult, some people won’t take no for an answer. Someone who is cut off from a bartender can easily go to a table of strangers and beg a drink from them. When dealing with experienced drinkers, it can be difficult to tell when to stop serving. You might be tipped off by either excessively loud or excessively withdrawn behavior. Your customer may not be able to completely focus on the task at hand, or may lose a little hand-eye coordination. You may be able to tell by rambling conversation or offensive language. Part of being a good bartender is knowing your clientele and being able to quickly spot those who may be under the influence. AACEA provides alcohol server training which promotes responsible service and sales of alcohol. AACEA is hosting a raffle for students enrolled in our alcohol server training classes – sign up today and you’re eligible to win $100 from AACEA and Len Riggs. To get your alcohol servers permit in Washington visit www.aacea.com. Too many people all crammed into a bar, the sway back, rock forward, tipsy movements. There she comes again, that specimen of service, gracing everyone with smiles, gentle excuses, and spirits. She weaves through the crowd, never stopping, never dropping. Her heart beats to the rhythm of the music, her hand twitches through her tickets, and her mind keeps track of all the loose ends. In the corner, a dark space, far against the wall, she keeps an eye on those two love birds, filling the glass, or stopping to ask if the comfort is still there. Also, at arms length, she watches those bodies, all of those bodies, because her word is the law when it comes to making sure safety is upheld. Her service requires care for every individual, a blessing and a curse, as they beckon, are denied, yell and scream, blink and babble. Unexpectedly, righteously, she stands between that door. No one leaves with their breath on fire, or their track off kilter. A cab can be called, or a friend, and she knows just what to do, water and well wishing keeps this smile in service. The Author, Alexandra Erwin, is one of our runners up in the Scholarship to Save Lives competition. In addition to our $500 scholarship, we selected 3 recipients for a runner-up prize of $100. Thank you so much to Alexandra and to all of our entrants. Scholarship to Save Lives Winner!